Sir Henry Lytton first joined the D'Oyly Carte Opera Co. in 1884 and served as a member of the company almost continuously for fifty years, the last twenty-five of them as principal comedian. When Rupert D'Oyly Carte decided to revive the Savoy operas in central London in 1919 after a ten year absence, he initially wrote to Charles H. Workman in Australia (where he had lived since 1914) to persuade him to return to England to resume the rôle of principal comedian with the company. Workman, however, chose to stay put, and so D'Oyly Carte appointed Lytton as the lead comic of the London company — a capacity that he had filled with the touring repertory company since 1909. 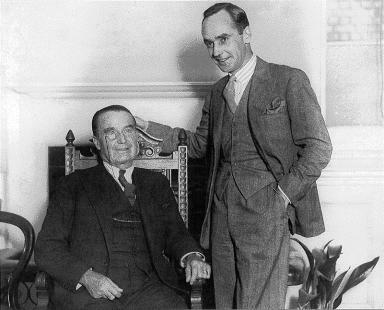 Sir Henry Lytton, with his successor Martyn Green pictured on the day of his last London performance in January 1933. Lytton's subsequent popularity with London audiences during the 1920s and early '30s was so great that, when he at last decided the time had come to 'move on', his Farewell performance in the metropolis was accorded the honour of being broadcast 'live' by the B.B.C. "In the evening at 9.40 National listeners will be transferred to the Savoy Theatre, where Sir Henry Lytton is making his last appearance in London in Gilbert & Sullivan Opera. The opera to be given will not be known until a few minutes before the curtain rises." 9.40 [PM]:— Last night of Rupert D'Oyly Carte's season of Gilbert and Sullivan Operas, relayed from the Savoy Theatre. Given that the B.B.C. 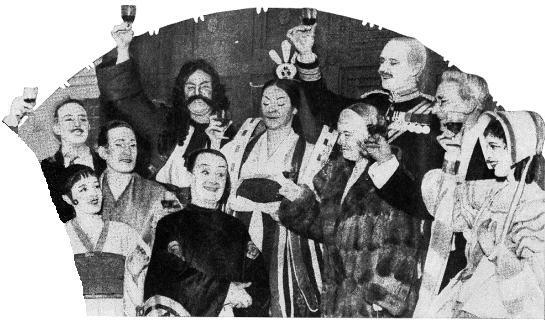 broadcast commenced at 9.40, (no doubt timed for the theatre audiences' return from the between-the-Acts interval), the radio listeners would have heard the first Act of The Mikado, the curtain calls and possibly Henry Lytton's final curtain speech. 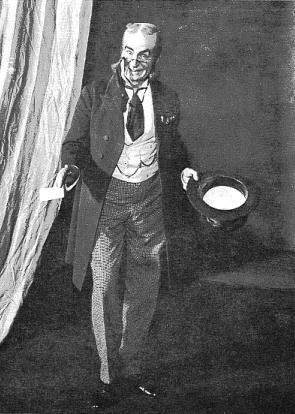 Sir Henry Lytton is toasted by the company following his farewell London performance at the Savoy Theatre. Well, here I am almost at the end of my story, but I have a few things that I should like to say before I put down my pen. One matter I feel I must mention is the question of my retirement. So many of my friends have asked me exactly when I am retiring. Frankly, I do not know. As long as the public wants me — which, I hope, will be a long time yet — and as long as I have the health and vitality to act, I certainly want to. On the other hand, I sincerely hope that immediately I am showing signs of beginning to bore, the public will "signify the same in the usual manner". On February the fourth of next year, 1934, I shall have completed half a century on the stage, and I hope, as I said when I bade farewell to my London audiences at the Savoy Theatre recently, that when that time comes I shall be carrying my bat "not out." Up to the moment I have made something like fifteen thousand appearances during that period, and, without boasting of my success, I can say that they have been happy appearances. At all of them I have been fortunate enough to be able to feel that my audience was with me — the most wonderful feeling an actor or actress can have. And, that being so, I cannot imagine anything more disconcerting or more mortifying than to outstay one's welcome and to go on in a fool's paradise. Therefore, no matter for how long or for how short a time I remain actively engaged in the theatrical profession, I do sincerely hope that my audiences will intimate to me as kindly as they can when they have had enough of me, or when I show signs that, despite all my efforts, my best has deteriorated into only a second-best. But, frankly, I cannot contemplate retirement. While writing these reminiscences I am on a tour of the provinces where my reception in all the big cities which I have toured so frequently before - Liverpool, Glasgow, Edinburgh, Newcastle, Sheffield, Manchester, Leeds and all the others — has been simply marvellous. I cannot tell you, my dear friends of the theatre, how much I thank you for the kindly reception you are continuing to give me. I thank you from the bottom of my heart. Certain it is, God willing, I shall continue touring until I have completed my fifty years of theatrical life. After that . . . who knows? The intention at the moment is that I shall retire at the end of this present tour, but as I have said already, I really cannot believe it. It is more than my imagination is capable of doing to project myself, as it were, forward to the day when "the would-be, the could-be, the might-be, the inevitable must" shall have arrived. I think you can understand what I feel about that. Whatever happens I shall never say goodbye. I hate the word. Always shall my farewell be au revoir. It is so much pleasanter, so much kinder, and in this life we must contemplate the pleasant and the kind, although at the same time we must not be foolish like the ostrich and endeavour to bury our heads in the sand in an abortive effort to frustrate the inevitable by ignoring it. But I fear I am becoming too serious or too sentimental. Perhaps it is because perforce, as I write these words, I am recollecting my farewell night at the Savoy Theatre, London, at the end of January last. That was a wonderful night which I shall not forget, even though I should live to be a centenarian - which I hope I shall! In my time I have played many parts, as Shakespeare says, or almost says, but never before had I playe done so difficult as that which called upon me to walk on the stage at the Savoy for the last time and say au revoir to my London audiences. Perhaps the biggest compliment that was ever paid me in my life was paid me on that night. I refer, in a sense of deep appreciation, and in no way in a sense of boastfulness, to the fact that something like four thousand people were unable to get into the theatre to bid me au revoir. To those I should like to say, "Thank you" — simple words, but sincere. "My dear friends, this is the most difficult part I have over had to play. If I fail I feel sure you will forgive me. On February the fourth, 1934, I complete my fifty years on the stage. It is a wonderful innings, and I hope to carry my bat. Before I go I want to thank you all for the way you have helped me in my work, and I also want to thank the Press for their very generous criticisms. "In the words of that great master Gilbert, we have to make "the inevitable must". The inevitable "must" has come and I have to say farewell to this beloved theatre. It is very difficult — very — and I know you will forgive me if I do not dwell on this. "Before I go I want to thank the company for the way they have worked with me. Team work is the great secret of the success of any enterprise, particularly theatrical, and in this company you certainly have wonderful team work. "It was a wonderful rebuke, but I have never forgotten it. "As Gilbert's lines were the first I ever spoke on this stage, I think it is only fitting that they should be my last. I am not going to say good-bye — I hate the word — but I shall say instead, au revoir." In that little speech you will notice I mentioned the company. Each and all have been wonderful friends and colleagues, in fact wonderful supporters, and, paradoxically, this is another reason why, sooner or later, I must retire. A younger man [Martyn Green] whom I have already mentioned must carry on the good work. He has been awaiting his chance patiently for years to be able to play the leads which I have been fortunate enough to play for so long. Among a very distinguished audience were a number of well-known people whom I should like to take the opportunity of thanking individually for coming to my last London show. They included Lady Gilbert, Lord Finlay, Lord Plender, Sir Noel and Lady Curtis-Bennett, Sir Thomas and Lady Polson, Sir Ernest and Lady Wild, Miss Mackintosh, Sir Harold and Lady Elverston, Dame May Whitty, Dr. and Mrs. Pollock, Mr. Derek Oldham, Mrs. Reeves Smith, Mr. J. F. Clynes, my wife and my two daughters, Mrs. Edward Elverston and Mrs. Charles Gay. Following the usual custom at the last night of a London Gilbert and Sullivan season, the programme was not announced until it was handed to the audience as they took their seats. Even I did not know which parts I should play until I arrived at the theatre and had to make up. In fact the programme was Act I of The Pirates of Penzance and Act I of The Mikado, interspersed with Richard Watson singing very beautifully the Sentry Song from Iolanthe and an orchestral potpourri arranged by Mr. Geoffrey Toye. I think the most thrilling moment of the whole evening was when I had to come on from the wings for the last time to play that marvellous role of Ko-Ko and had to speak that line, "I am greatly touched by this reception." Like so many of the wonderful lines from these delightful operas, it might have been written specially for the occasion, and the applause with which it was greeted put my heart in my throat with gratitude. Never have I heard such applause and never has applause affected me so strangely. Every honest actor will tell you that applause is his life blood. That is no mere conceit, for after all it is the only way an actor can tell whether he is doing his job properly. On this score I would ask you always to support stage artists by your applause if they deserve it, since it will help them to give of their best, and if it is not forthcoming it might conceivably cause an otherwise perfectly good artist to fail dismally. But, strangely enough, this very fact which I have emphasized about the appreciation of an audience was reversed on this occasion. For just one moment I was so moved that I felt I could not go on, but fortunately I pulled myself together and remembered what I owed those wonderful people out in front, and, incidentally, those millions of people who were sitting in their homes listening on their wireless sets - for the occasion was deemed to be sufficiently interesting to warrant broadcasting by the B.B.C. Friends told me afterwards that the applause lasted for two minutes, but to me it seemed an eternity, so full was I of feeling; almost overcome by the poignancy of the situation. To confess the truth, I had been dreading that moment. To bid farewell to friends is always a sad business, and the audiences at the Savoy had been my sincere friends for so many years that I felt I should not be able to trust myself when the moment came, and I was certain in my own mind that I should be seized with dreadful stage-fright so that I should be unable either to act or to speak. Fortunately, however, my worst fears were not realized, and looking back on the occasion, it was not an unhappy one; in fact it is one which I shall remember with gratification. Well, so a glorious and wonderful evening came to an end, and the curtain was lowered for the last time at the conclusion of my last performance at the Savoy. But before I could get off the stage I was surprised by another tumultuous burst of applause. This time not only from the crowded auditorium, but also from the cast who had been playing with me and who were on the stage. They all gathered round to my support clapping vigorously, and while I was endeavouring to spot a point in the "cordon" through which I could break, the curtain went up again and I was caught in a storm of kindness — a sort of friendly barrage which came from all directions. It is impossible for me even yet to analyse my feelings in such a way to make it possible for me to express them to you now, so I will not try. I know that I got to my dressing-room and cleaned off the greasepaint, sitting before my mirror there for the last time, and as quickly as I could changed from the role of Ko-Ko to that of Harry Lytton. And so out into the street via the stage door, where another surprise was awaiting me. Hundreds of people - or so it seemed to me - had gathered outside ready to give me one long last cheer and to wish me bon-voyage on my provincial tour. That tour is now well on, and at each theatre at which I have appeared my friends in all parts of the house have been unstinting in their appreciation of my humble efforts. As I said earlier in this chapter, I hope that I shall be able to continue for a considerable time yet interpreting the wonderful lines of the operas, and doing my best in turn to show my appreciation of my wonderful and loyal friends the theatrical public. that which teaches us to find it and to make the most of it. "A Wandering Minstrel" was published in September of 1933 when Lytton was in the midst of the subsequent provincial tours that followed his last London season. In February of 1934, he celebrated his 50 years with the company at a gala performance given at the Kings Theatre, Hammersmith, which was attended by G&S enthusiast and former British P.M. Lloyd George who presented him with an album inscribed with the hundreds of signatures of his many admirers. His career with the D'Oyly Carte concluded at the Gaiety Theatre, Dublin on 30th June, 1934, and fittingly, his last appearance was in his favourite rôle of Jack Point. At the end the audience rose in a body and shouted again and again for him. In reply, he said, "I have been your faithful servant for fifty years and to say good-bye to you is a very hard task — in fact, it is a tragedy. It is a tragedy for an actor to stand on a stage and know that when the curtain falls it falls on his last act". His final stage appearance was as the Emperor of China in Aladdin for the Birmingham Prince of Wales Theatre's Christmas — New Year season of pantomime in '34 -'35. Sir Henry Lytton died on the 15th August, 1936 at the age of sixty-nine. One night, however, J. W. Wells did not reappear for the second return. Instead, a large piece of white cardboard was pushed up through the trap with the words, in very large type: COME DOWN AND SEE ME SOME TIME! The house was convulsed with hysterical laughter, and the Company management were bordering on apoplexy. Such a thing had never been done before. How dared he? How-! What-! Never have human beings been so near literal explosion. But there was nothing they could do about it! It was almost his final performance. And Henry was as happy as only a small boy can be when he knows he has perpetrated the ultimate in mischief — and got away with it!